What’s the next big foodie enthusiasm? Robust flavors, earthy scents and lusty textures from the very soil that nourishes life. It’s called Veritable Cuisine du Terroir — literally, Food from the Earth Really — and in their copper-clad kitchen in the Marais district of Paris, chefs Solange and Gael Gregoire run one of the hottest bistros in a city long celebrated for its culinary prowess. Their restaurant, Le Plat Sal — which translates to The Dirty Plate — prepares four-star signature dishes, like Roche Dans la Croute, a rock from Mont Lachat folded into a pastry crust, and Boue Ragout, a stew simmered from the mud of the Seine River, washed down with a surprisingly delicate vintage of Du Vin d’Egout, a smoky gray wine distilled from Paris sewer water. “Very,” Simon had to admit, despite the unconventional ingredients. And great American chefs are developing their own classic takes. That includes James Beard winner Rick Bayless, the Chicago chef renowned for his Mexican cuisine. Bayless says that the Tzolkin, or Maya Divine Calendar, that was supposed to predict the end of the world in 2012, was off because “bits of the Tzolkin had been chiseled off to toss into a stew, named after Zipacna, the Maya god of the earth’s crust. We make a version in our restaurants, with chunks from Wrigley Field. It’s delicious,” he adds. “We think artisanal rocks, locally sourced and freshly prepared, are the next great American elegant-casual-customized-locavore-hand-made-food enthusiasm,” Meyer told Weekend Edition. 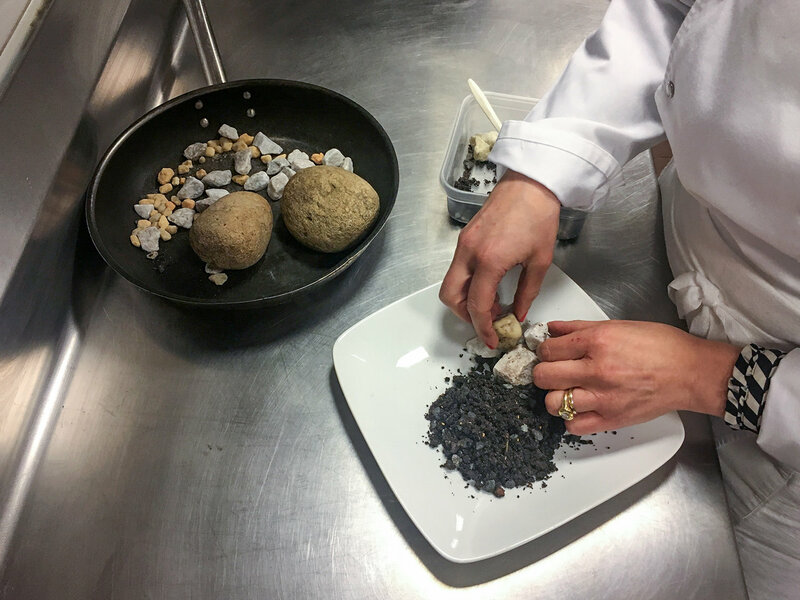 Meyer is opening the chain’s first two restaurants this fall, near his hometown of St. Louis, with rocks and dirt locally sourced from Laddonia and Cabool, Mo. “Does dirt from Laddonia have its own distinct flavor?” Simon asked. “It’s a favorite on our bar mitzvah menus,” says Gael, who then lifts the lid on a consommé with a rich, rusty color that’s called Ile de Cite, after the island that forms the middle of Paris. Key ingredients, in the city in which so many Parisians sit in cafes with their beloved dogs on their laps, are nuggets of dog ordure — which typically spendthrift Americans just bag and throw away. “We recognize those droppings for the precious saveur” — literally, flavor — “that they are,” says Gael. 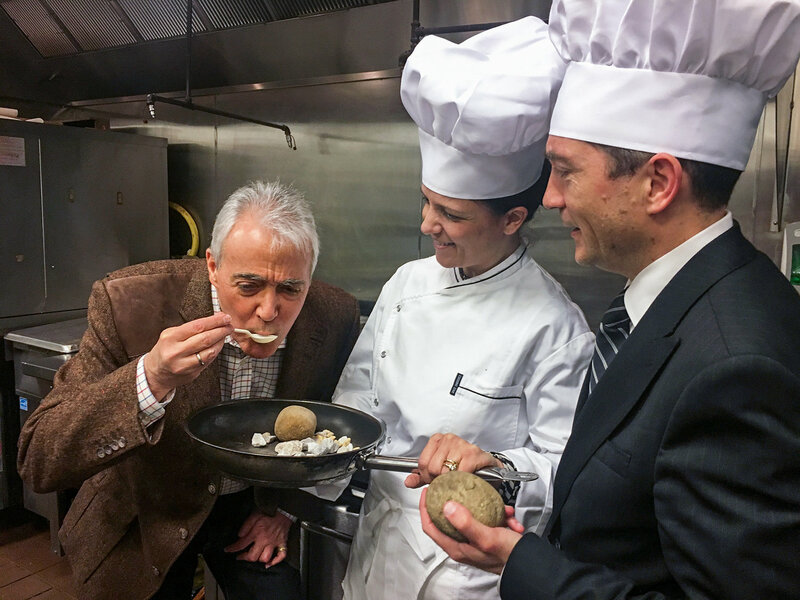 And although in the audio of this story, airing on Weekend Edition Saturday on April 1, you can hear Scott Simon cough in alarm when he realizes what he has ingested, Scott reports that now that he’s back home, he has learned from the kitchen mastery of the Gregoires. Daisy, the Simon family’s French poodle, is now an important contributor to their meals.